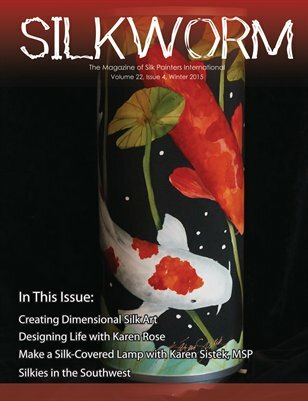 In the final issue of this year we investigate multi-dimensional silk. Pamela Glose showcases artists from the silk painting community who use various elements to make their art multi-dimensional. Karen Rose shares some of her fashions while Karen Sistek shares her instructions for making a silk lamp/lampshade. And a digital chapter of SPIN decides to meet and teach in an off-festival year.